Trichy:30th,May 2011:“Counselors, teachers, parents and others working and interacting with today’s youth, if they are to help, must have a solid understanding of the factors that young people face in making the often difficult transition between adolescence and adulthood,” said Mr.Pappu Ilango, a former Indian Revenue Service official after inaugurating Free youth counseling youth centre run under the aegis of Indian Management and communication centre, Trichy in Kalaiarangam premises here today. This centre has been launched by professionals of Indian Management and communication centre (IMC) with the support of Trichy District Nehru yuva Kendra, an organ of Ministry of youth affairs, Government of India. Its Director Prof.Irudayaraj said that the centre will function as facilitation centre for youth in need and confidentially will be maintained for each youth and the professional attached to this centre are to provide solutions with Psycho therapy. The centre has been instituted by experts as a “must-replicate for every youth counselor and mental health counselor,” provides the most current information and techniques for addressing dysfunctional family dynamics, low self-esteem, mood disorders, stress and trauma, eating disorders, suicidal behavior, teen sexuality and substance abuse, among other issues related to youth. In his presidential speech, the District Coordinator of Trichy Nehru Yuva Kendra, Mr.K.Subramaniam said the centre is aimed at solving youth problems by the centre counselors, social workers, psychologists. Mr.K.Subramaniam pointed out it’s important that professionals gain the latest prevention and intervention methods so that they can better respond to youth before they are in trouble. “It’s vital that counselors and educators have a better understanding of how youth become at-risk and what can be done to minimize such factors and prevent the problems that otherwise are almost bound to occur,” he said. Prof.Savarimuthu said in his key note address that the youth counseling program launched for catering to the needs of youth on individual basis, family and group counseling services to children and families who live in Trichy and surrounding Districts. Prof.Savarimuthu added ‘Youth In Need’s approach to counseling and to all clients is a strengths-based philosophy. This means that it’s necessary to explore and use internal strengths (abilities, coping skills and resilience) and external resources (family, friends, school, employers, and other community resources) of youth and families. Youth In Need believes that teens and families need information so they can make informed decisions. Education and resource-based information is offered to clients as a means of helping them explore options, become more knowledgeable about issues they face, become more skilled in managing their own lives, become better informed about service options and in better matching them with community resources. Therapists collaborate with youth, teens and families about the types of services that may best meet their needs, goals of service and tasks to achieve these goals. Finally, emphasis is placed on helping youth, teens and families to transition through stages of individual and family development manage stress and cope with the changes they face on a daily basis. Hope is one of the most important elements of change. While the absence of hope can be devastating, its presence can help youth, teens and families to better cope with adversity, change and crisis. Youth Counseling Center in Trichy, the analysis of relevant data, the young people the most serious psychological problems occurred in the adolescent period, but in addition to adolescent mental health issues. Dr.Gubendran said that youth Counseling Center consultants are professionals, youth mental health problems in the performance of various forms, mainly include: concentration, reverse psychology is too strong, usually cannot communicate with their parents, lack of intimacy with others, alienation, interpersonal barriers, as well as life, to learn there is no sense of purpose, sense of life without meaning, puppy love, etc. problem. Organic practices increases mango yield in Thottiyapatty, SEVAI- FdnF Watershed-Project. Thottiyapatty SEVAI Watershed, once a fallow land after watershed implementation of FdnF, assistance the Mango trees cultivated in this Thottiyapatty watershed respond well to organic manure applications such as vermicompost, panchagavya and vermiwash are used for promoting healthy tree growth and fruit formation. SEVAI and watershed team of Thottiayapatty closely monitor the follow up this watershed implemention, and the farmers those are trained in organic farming in Thottiyapatty village near Trichy understood the essential nutrients needed for Mango cultivation. During the watershed project initiation, the initial planting stages to caring of full-grown trees, Panchagavya and vermicompost were effectively used to supply essential nutrients to the trees and prevent pest infestations, according to K.Devendran, Vermi technologist in SEVAI, Trichy. Vermicompost is prepared by using earthworms. Vermiwash is the liquid collected after the passage of water through a column of activated earthworms. It is very useful as an organic spray for all crops. As Pest repellent, Panchagavya an organic growth promoter, which is prepared by mixing cow dung, cow urine, cow's milk, curd and ghee in suitable proportions, and is sprayed on the plants. It contains several macro, micronutrients, beneficial bacteria and fungi, which aid in growth promotion and act as effective pest repellents. It is prepared by thoroughly mixing five kilos of fresh cow dung and one litre of cow's ghee in a earthen pot. The mixture is stirred daily for three to four days. "About three litres of cow's milk, two litres of cow's curd, three litres of sugarcane juice, three litres of tender coconut water and 10 to12 bananas are mixed well and added to the mixture. The entire concoction is allowed to ferment for fifteen days," said K.Devendran. The container is covered with a cotton cloth to allow aeration of the fermenting unit, according to him. The concoction is stirred two or three times a day for about fifteen days and then used. For mango trees of about 5-6years age, vermicompost has b been applied at the rate of 10 kilograms per tree and one litre of panchagavya diluted in 30 litres of water is sprayed over the foliage and at the base of the tree. Spraying Panchagavya over the crown and at the base of the tree must be done four to five times. The first spraying was done before the flowering season (January-March) to increase flower formation. A second spraying was done after 15-20 days. The process was repeated till the flowers turn into small sized buds. Once the buds start forming then the application was done once a month. Use of Panchagavya and vermicompost has been found to increase the size, number and enhance the colour of the fruits. The project promoter K.Devendran said “The recommended practice for one hectare of mango trees is about 25 litres of panchagavya (mixed in 750-800 litres of water) and four to five tonnes of vermicompost. Spraying panchagavya has been found effective in the control of fruit fly menace, a common infestation in all fruit bearing trees”. According to him, trees treated with organic manures bore large sized leaves and formed a dense canopy with profuse rooting systems. The taste and shelf life of the fruits were also found to be more satisfactory. "The interaction of the root hairs of these trees with the organic manures also increased the activity of the nitrogen-fixing bacteria in the soil. "The organic manures also act as a carrier medium for the development of several beneficial micro organisms such as azospirillum, azotobacter, rhizobium and phosphobacteria," K.Devendran said. Neelam, one of the mango varieties, does well under organic farming in Tamil Nadu, and its full potential has been exploited by the small and marginal farmers of watershed of Thottiyapatty.Farnmers of Thottiyapatty Watershed has successfully demonstrated the cultivation by the superior mango variety `Neelam'. This variety is suited for high density planting, and it will make up for the low yields in the initial few years of bearing. "During the first five years Daincha was raised as rain fed crop, and ploughed in situ as an organic nutrient supplement. Women in two wheelers fight against social and economic injustices and work towards women empowerment through Literacy and Self help group movements. Around 100000 women in Trichirappalli district of Tamil Nadu has emerged as prospective Self help group members, most families here rely on land for sustenance, converted barren soil and promoted irrigation systems means better crops, relieving families from cycle of poverty. In early nineties with the support of District Administrative local NGO namely SEVAI had been involved in National Literacy Campaign and recruited women volunteers who dedicated their free time to street theatre programs for illiterate audiences. Amala, Vanitha and her colleagues decided to mobilize public support for a large-scale literacy project for their under served locality, and eventually secured government and SEVAI backing. One of the first priorities was to recruit full-time volunteers and determine how to deliver lessons with maximum efficiency. Vanitha, Amala and her colleagues suggested that the women could perhaps be taught to ride bicycles. As well as learning to read and write, both the volunteers and their pupils would master the art of two-wheel travel. As a gentle introduction to the idea and to help women overcome their apprehension, a number of motivating cycle songs were sung in the rural communities. Earlier the husband would ride with the wife sitting behind. 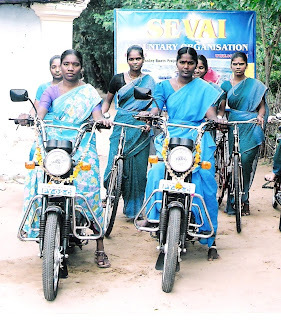 This is now an old story, as SHG organizers of women self help group members, Vanitha and her colleges use two wheelers for promotion of Female literacy and livelihood programs in rural areas through self help groups. SSA-IED Special educators are honest and open to talk to their children openly about mental disabilities. A good mathematics teacher needs to create ``infectious enthusiasm” among students. A good mathematics teacher creates among students ``infectious enthusiasm" said Dr.K.Govindaraju, while addressing the mathematics teachers of High schools in Trichy on Saturday, 29, May 2011 in SEVAI Shanthi Matriculation Higher Secondary school. He further added ‘Every great mathematics teacher has his or her own teaching style and philosophy, good teachers respect their students, effectively engage students by treating teaching and learning as a collaborative process and by showing their students that their thoughts and opinions are valued. It can be really good motivation for students to feel that they're working with their teacher to develop their understanding of a sum in mathematics class situation. Having students ask and answer questions about the material being covered is a great way to get them really thinking about the ideas for themselves. Also, some teachers really encourage their students to talk to each other and it is a great way to show students how much they can learn from each other, independent of their teacher. Along those lines, great teachers should challenge their students. They should encourage their students to get out of the mindset of "I only know as much as my teacher tells me". In math, many students end up expecting all the problems they encounter to be similar to some example they've been shown. An invaluable skill that great teachers pass on to their students is the ability to take their knowledge and skills and apply them in unfamiliar situations. It's important to show students that they can do things on their own. Great mathematics teachers provide positive encouragement and credit where it's due. Especially in math, good teachers provide motivation and explanation for the material. It's so easy to get caught up in formulas and theorems and simply ignore where they came from but it's so important to make sure that students realise that math doesn't just come out of nowhere. Even in cases where rigorous explanations are a little beyond the students, good teachers can appeal to their students' intuition and give basic ideas about why things are true. Being able to show students that math is all about logic and reasoning and that it should make sense I think is the mark of a really incredible teacher’. 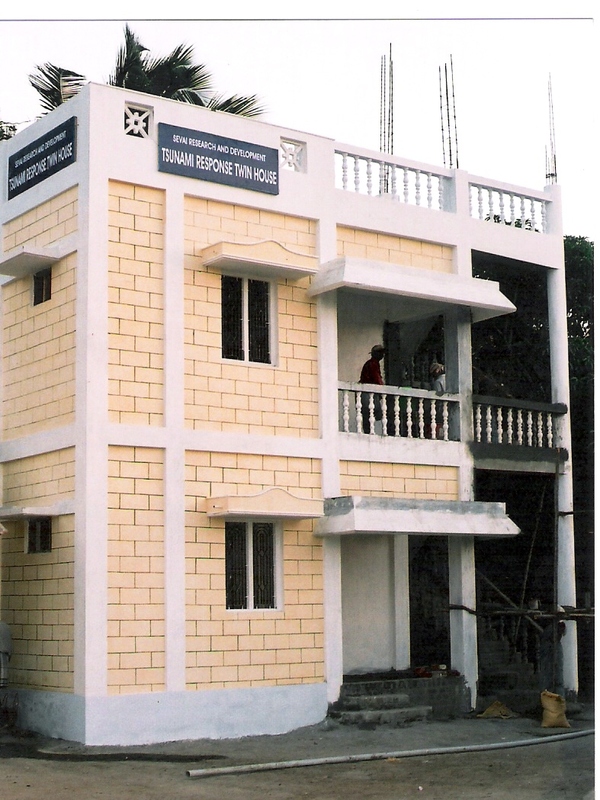 Cost Effective Housing Technology is a concept which deals with effective budgeting and following of techniques which help in reducing the cost construction through the use of locally available materials along with improved skills and technology without sacrificing the strength, performance and life of the structure. There is huge misconception that cost effective housing is suitable for only sub standard works and they are constructed by utilizing cheap building materials of low quality. The fact is that cost effective housing is done by proper management of resources. The building construction cost can be divided into two parts namely: Building material cost: 65 to 70 %, Labour cost: 65 to 70 %.Now in low cost housing, building material cost is less because we make use of the locally available materials and also the labour cost can be reduced by properly making the time schedule of our work. Cost of reduction is achieved by selection of more efficient material or by an improved design. Areas from where cost can be reduced are Reduce plinth area by using thinner wall concept, Ex.15 cms thick solid concrete block wall, Use locally available material in an innovative form like soil cement blocks in place of burnt brick., Use energy efficiency materials which consumes less energy like concrete block in place of burnt brick, Use environmentally friendly materials which are substitute for conventional building components like use R.C.C. Door and window frames in place of wooden frames, Preplan every component of a house and rationalize the design procedure for reducing the size of the component in the building, By planning each and every component of a house the wastage of materials due to demolition of the unplanned component of the house can be avoided, Each component of the house shall be checked whether if it’s necessary, if it is not necessary, then that component should not be used. Normally the foundation cost comes to about 10 to 15% of the total building and usually foundation depth of 3 to 4 ft. is adopted for single or double store building and also the concrete bed of 6″(15 Cms.) is used for the foundation which could be avoided. It is recommended to adopt a foundation depth of 2 ft.(0.6m) for normal soil like gravely soil, red soils etc., and use the uncoursed rubble masonry with the bond stones and good packing. Similarly the foundation width is rationalized to 2 ft.(0.6m).To avoid cracks formation in foundation the masonry shall be thoroughly packed with cement mortar of 1:8 boulders and bond stones at regular intervals. It is further suggested adopt arch foundation in ordinary soil for effecting reduction in construction cost up to 40%.This kind of foundation will help in bridging the loose pockets of soil which occurs along the foundation. It is suggested to adopt 1 ft. height above ground level for the plinth and may be constructed with a cement mortar of 1:6. The plinth slab of 4 to 6″ which is normally adopted can be avoided and in its place brick on edge can be used for reducing the cost. By adopting this procedure the cost of plinth foundation can be reduced by about 35 to 50%.It is necessary to take precaution of providing impervious blanket like concrete slabs or stone slabs all round the building for enabling to reduce erosion of soil and thereby avoiding exposure of foundation surface and crack formation. Wall thickness of 6 to 9″ is recommended for adoption in the construction of walls all-round the building and 41/2” for inside walls. It is suggested to use burnt bricks which are immersed in water for 24 hours and then shall be used for the walls. Rat – trap bond wall, It is a cavity wall construction with added advantage of thermal comfort and reduction in the quantity of bricks required for masonry work. By adopting this method of bonding of brick masonry compared to traditional English or Flemish bond masonry, it is possible to reduce in the material cost of bricks by 25% and about 10to 15% in the masonry cost. By adopting rat-trap bond method one can create aesthetically pleasing wall surface and plastering can be avoided. Concrete block walling, In view of high energy consumption by burnt brick it is suggested to use concrete block (block hollow and solid) which consumes about only 1/3 of the energy of the burnt bricks in its production. By using concrete block masonry the wall thickness can be reduced from 20 cms to 15 Cms. Concrete block masonry saves mortar consumption, speedy construction of wall resulting in higher output of labour, plastering can be avoided thereby an overall saving of 10 to 25% can be achieved. Soil cement block technology, It is an alternative method of construction of walls using soil cement blocks in place of burnt bricks masonry. It is an energy efficient method of construction where soil mixed with 5% and above cement and pressed in hand operated machine and cured well and then used in the masonry. This masonry doesn’t require plastering on both sides of the wall. The overall economy that could be achieved with the soil cement technology is about 15 to 20% compared to conventional method of construction., Doors and windows, It is suggested not to use wood for doors and windows and in its place concrete or steel section frames shall be used for achieving saving in cost up to 30 to 40%.Similiarly for shutters commercially available block boards, fibre or wooden practical boards etc., shall be used for reducing the cost by about 25%.By adopting brick jelly work and precast components effective ventilation could be provided to the building and also the construction cost could be saved up to 50% over the window components,Lintals and Chajjas,The traditional R.C.C. lintels which are costly can be replaced by brick arches for small spans and save construction cost up to 30 to 40% over the traditional method of construction. By adopting arches of different shapes a good architectural pleasing appearance can be given to the external wall surfaces of the brick masonry, Roofing Normally 5″(12.5 cms) thick R.C.C. slabs is used for roofing of residential buildings.